One of the few foods that contain potato which have remained with me after moving out from my childhood home is cooked, fresh new potatoes. 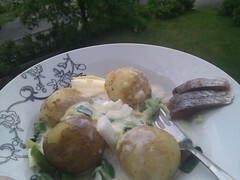 In Finland it’s traditional summer food that is restricted to summer months, starting from Midsummer or so (if you prefer to use Finnish new potatoes). It’s a real Midsummer Feast delicacy and a cornerstone of Midsummer Party dining. In Finland the new potatoes are sold in one form: with some soil still on them. 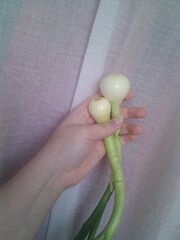 You can get them from the market squares, quaint little stalls or just go to your local supermarket. The option of growing them yourself is of course also available; I hear they’re perfectly capable of surviving in a big pot on a balcony. The starting point is potatoes. In Finland, as said, they’re sold with some soil on them, so you need to scrub them. I prefer to scrub mine very well, so that there isn’t any grit grinding when I’m eating: I don’t peel my new potatoes at all. The tradition says that the potatoes should be put in boiling water with a pinch of salt and preferably with dill. I’m not too big fan of dill myself, limiting its use only to gravlax, so I’m not using any here either. 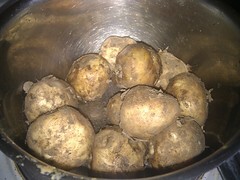 When boiling the potatoes, remember to keep them covered with water, and not let the water boil too hard. While you’re boiling your potatoes, you’ve got time to blog, upload some photos from your camera and organize your Flickr collections… or whip up a salad, or a posh onion sauce. My onion sauce isn’t all too traditional, what my mum used to serve was onions boiled a bit in milk with a dollop of butter. My sauce consists of all those, but also flour: I chop my onions, twirl them around in melting butter in a pan, add couple of teaspoonfuls of normal flour and mix again for few minutes, not browning the flour or cooking the onions, though. 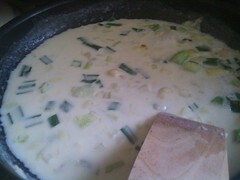 To this base some milk is added and cooked on low heat until it thickens a bit. Or with all the above and the sauce!